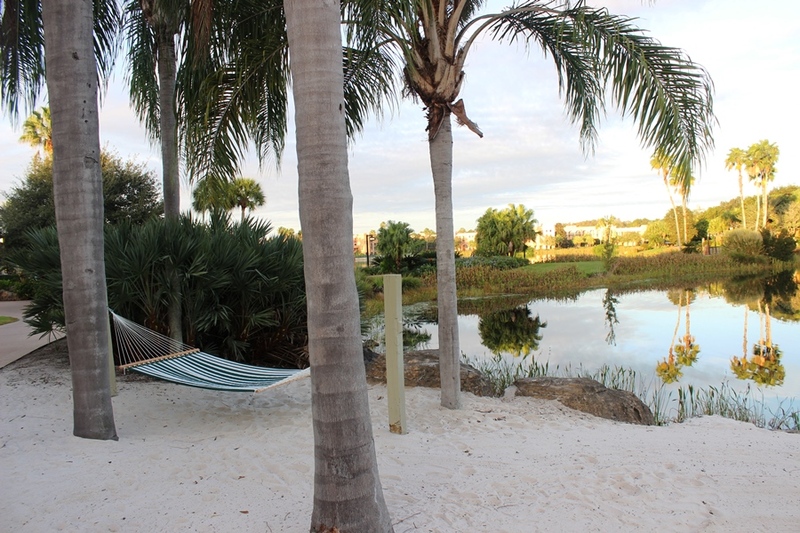 The Disney Vacation Club is often touted as the best kept secret on Walt Disney World property. At one point in time, when the program was in its fledgling years and only had a resort or two that welcomed guests home, that may have very well been true. 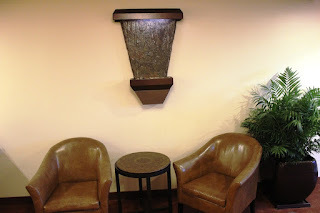 Today the resorts and perks associated with the Disney Vacation Club are well-known and, for those guests that haven’t heard, there are an abundance of kiosks throughout the resorts and parks for those seeking more information. For my money, however, the best kept secret to be found around the resorts is the business class offerings from Coronado Springs. 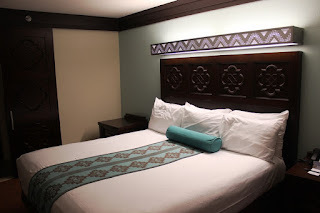 Let’s back up for a minute and explain why Coronado Springs would even need business class accommodations. The majority of conference spaces, ballrooms, and major event spaces available at Walt Disney World come from the deluxe category of resorts. The Grand Floridian, Contemporary, and Yacht Club stand out as the most popular options for organizations seeking a little magic in there gatherings. What may come as a surprise to some is that Coronado Springs also offers up ample convention space. With this clientele, you are going to have individuals who are looking for business amenities, not to mention they’ll want to be close to all of the convention action. 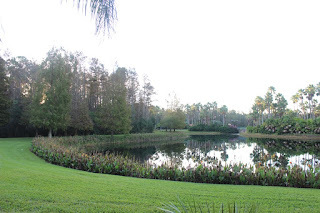 Heck, they might even bring along their families who will want to be close to the slightly more magical and less business-minded areas like the pool, restaurants, and transportation to parks. Enter Coronado Spring’s business class. Let’s start with the interior of the rooms. There are plenty of upgrades to the rooms themselves, but let’s focus on the comfort items. The bed has an upgraded mattress and the thread count for sheets is also higher than would typically be found in a moderate resort. There are also bathrobes perfect for, well, whatever one typically does in a bathrobe. Drink coffee and read the news? Lounge around? Use as a plushy, oversized towel? I don’t know, it’s not really my thing, but I know the missus loved the one she had! Think of the rooms this way, you’re getting the comfort features of a deluxe for the slightly elevated price of a moderate. And, with everything else that comes along with the room rate, you are definitely getting your money’s worth. What else are you getting in business accommodations? Stepping out your door you are quite literally steps from El Centro, the main hub of resort activities, and just a bridge away from the Dig Site pool and recreation area. 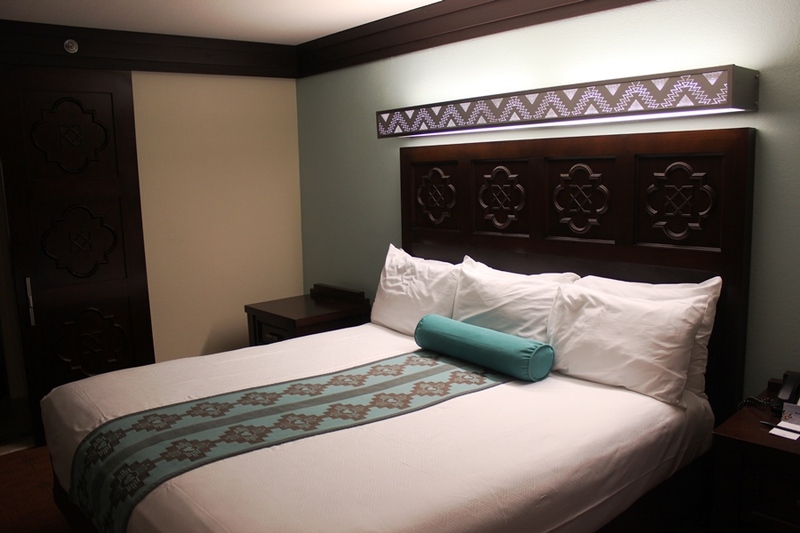 The rooms, not the suites, associated with business class are located in the Cabanas section of the resort, in building 9B, right next to El Centro. This also means upgraded views and not a parking lot view in the mix. 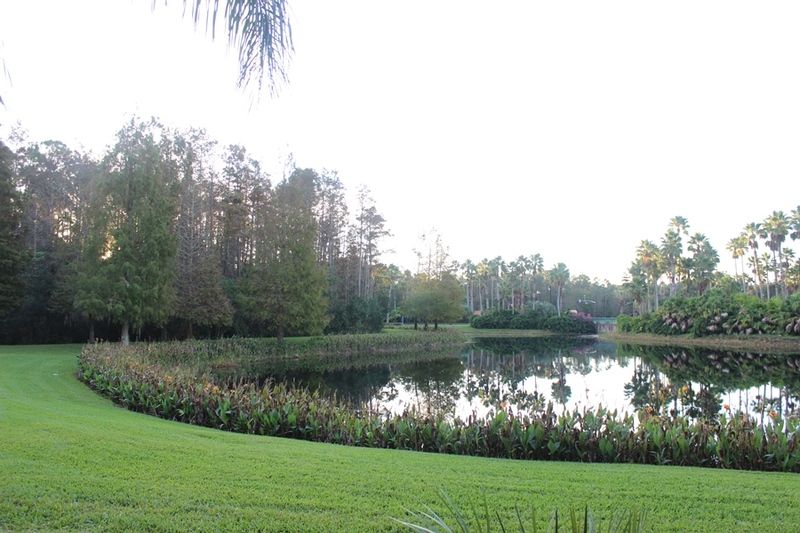 Rooms look out over the Lago Dorado or woods and wetlands the border the resort’s property and Buena Vista Drive. In fact, the closest you get to pavement in your view here would be where our room was located and you could barely see the traffic light at the entrance of the resort in the distance. Last, but certainly not the least of the perks, is access to the Coconino Cove. This lounge is located on the first floor of building 9B and requires key card access for those staying in business class. The interior takes up the space of what would have been several spacious resort rooms and has turned them into small sitting areas. There’s even a television for catching up on the news, watching a movie, or seeing what’s happening around Walt Disney World that day. The Cove is open daily from 7:00am – 10:00am and 5:00pm-10:00pm. 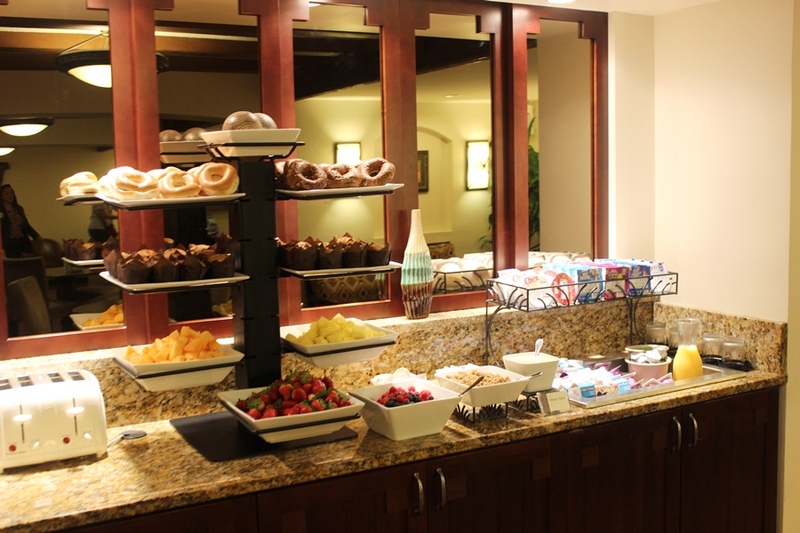 During the morning hours Coconino Cove have a complimentary continental breakfast of sorts, with offerings including juice, coffee, milk, yogurt, fresh fruit, granola, cereal, and assorted pastries. In the evening the offerings turn to beer, wine, soda, and salty snacks like pretzels, chips, salsa, and assorted nuts. The morning menu will send you off into the parks with a full stomach and less a dent in your wallet, while the evening’s bites are more or less a way to wind down. The operating hours do make it a bit tricky to enjoy the comforts of Coconino Cove. In a perfect world they would open at 6:00am for the morning hours and close around 11:00pm or midnight, to give guests time to get back after the parks have had their nighttime spectaculars. Of course, at this point, that’s just being nitpicky. Coronado Springs is not a resort that gets a lot of press for families on vacation. As moderates go, it doesn’t have the draw of the Port Orleans resorts or feel like it is in the heart of Walt Disney World the way that Caribbean Beach feels. At best it seems to be relegated to families who happen along with a business bound parent, but the resort is so much more than that. There is lush scenery and gorgeous details that bring Coronado Springs to life. And if you’re looking for a little extra pampering without the cost of a deluxe, there is nothing better in my mind than staying in their business class accommodations.